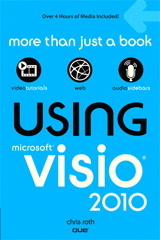 You are here: Home / Visio Content / Shapes / A Re-programmable Visio Multi-shape: The Configurable Stickman! That’s one single shape that can be set to five different positions! There’s also a Shape Data field, available in the Shape Data Window. You can see it on the right in the illustration above. Select Position offers a drop-down list with the same five options you see in the context menu. The nice thing about the Shape Data field is that you can select several shapes at once and change them. With right-clicking, you can only operate on one shape at a time. I call this; “dual mode“. In the last illustration, you might have noticed the “Design Mode” option in the context menu. Well, the Configurable Stickman has two modes: Design Mode and Run Mode. Or just Design Mode and NOT Design Mode, if you will. You can pull on the control handles to repostion the head, hands, elbows, shoulders, hips, knees and ankles of the Stickman. And you can give the position a name, using one of the five “Position N Name” Shape Data fields. Once you’ve got your man set the way you like, you can then “burn” the current position into the shape’s memory by selecting one of the “Set ‘position name’ Data” options in the right-click context menu. Yup, that’s right, the Configurable Stickman works like a Field Programmable Gate Array, he’s an open book, just waiting to be re-programmed! Right-click the shape and make sure “Design Mode” is checked. 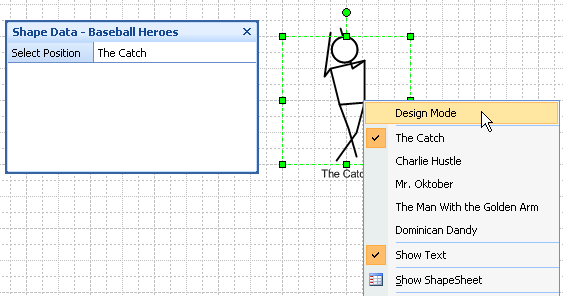 In the Shape Data window there will now be five Position fields that allow you to specify names for each pose. Right-click the Stickman and choose: “Set ‘Standing Up’ Data. This has the effect of “burning” the current pose into the shape’s memory. Repeat for all five poses. Right-click and uncheck “Design Mode”. Once you’ve got your man set the way you like, you can disable the ability to go into design mode by setting a value in the ShapeSheet. Once you’ve defined a set of poses, you might want to ensure that your users don’t mess the shape up. I’ve added a back door feature that lets you hide the Design Mode option from the context menu. This requires using the ShapeSheet, so buckle up and hold on tight! 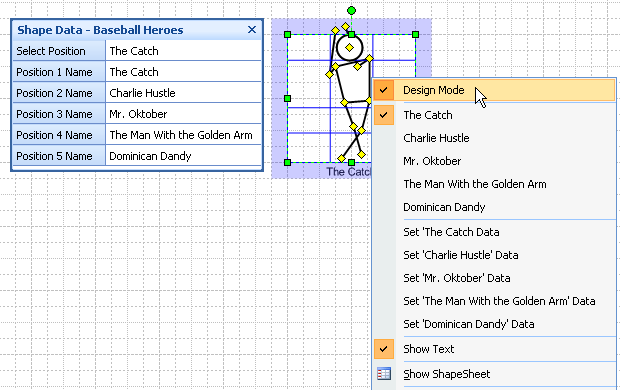 To turn off the Design Mode menu, just go to Window > Show ShapeSheet and look for the User-defined Cells section. The Design Mode option won’t show in the shape’s context menu any more, and your end-users won’t accidentally mess up your poses. Your Stickman will be safe from curious hands. In the download at the end of this article, both Baseball Heroes and Ape to Man have show design mode turned off, so you won’t accidentally change them. A lot of readers are interested in building there own shapes, so I like to say at least a few words about how the shape works. If you’re not one of those types, I strongly recommend skipping to the next section…NOW! For the rest of you brave soles, I won’t go into extremely deep detail right now because…well…you’ll fall asleep, but I’ll give a general overview of how the shape works, and show off some frightening ShapeSheet formulas just to titillate and amaze. The shape makes heavy sick use of the SETF ShapeSheet function. It uses this to blast data for the current positions of the yellow control handles into position-defining cells, and to blast stored data back to the control handle cells. So first off, we have a cell called User.dataCurrent that holds all of the x- and y-values for all of the control handles, normalized as percentages of the shape’s Width and Height. When you click one of the “Set Position” context menu items, you blast the values in User.dataCurrent into onf of five data-holding User-cells: User.dataPos1, User.dataPos2, User.dataPos3, User.dataPos4 or User.dataPos5. So when you click on “Set Position 1 Data”, the information in User.dataCurrent get’s “flashed” to User.dataPos1. It looks something like this when it’s all done–just a bunch of numbers! The values in the User.dataPosN cells are just waiting for your end-users to select a new position. And once a user does that, another bunch of SETFs blast this numerical data into the control handle cells. So the ShapeSheet formulas look complicated, but the logic is fairly simple. Normally, I wouldn’t recommend using SETF so much in a shape, because, well the ShapeSheet is a spreadsheet engine, and cells are supposed to depend on each other, not blast each other’s values. But considering that the SETFs are called relatively infrequently, I think it’s OK here. The SETFs only get called when a user specifically selects a new pose, or when a designer flashes a set of data. If these things were being triggered, say every time the Width was changed, then I would get worried. It’s also interesting to note that there is no reason that this shape needs to be a Stickman. The control handles could control the position of anything. There’s nothing to stop you from deleting the Geometry from the Stickman’s group, then adding new Geoemtry, or sub-shapes inside of the group, that react to the control handle positions. You could create a set of pre-configured offices, where the furniture gets moved to any of five positions. You could create an array of shapes that can be aligned horizontally, vertically, in a circle, or along two diagonals. The possibilities are endless! Since you can now create your own multi-shapes, let us know what you’ve come up with! It would be fun to add a gallery of reader-defined stickmen to this post or another post, and even offer the ‘men for download. Get Your Configurable Stickmen Here! And last but not least, here’s the download for you to play with, experiment with, and enjoy! Hurray!! The first Advent Calendar shape I do not know. Greetings from NRW.. WOW!! Really cool article on multi-shapes. I wish i came across this article a couple years prior, certainly could have learned have some things much easier using this shape as an example.